Editor’s Note: The following is based on research and studies performed in their Santa Cruz Lab, with contributions from Mikhail Gadomski, Lab Manager, Ryan Maus Technical Services Analyst, Laurie Post, Director of Food Safety & Compliance, and Charles Deibel, President Deibel Cannabis Labs. Heavy metals are common environmental contaminants resulting from human industrial activities such as mining operations, industrial waste, automotive emissions, coal fired power plants and farm/house hold water run-off. They affect the water and soil, and become concentrated in plants, animals, pesticides and the sediments used to make fertilizers. They can also be present in low quality glass or plastic packaging materials that can leach into the final cannabis product upon contact. The inputs used by cultivators that can be contaminated with heavy metals include fertilizers, growing media, air, water and even the clone/plant itself. The four heavy metals tested in the cannabis industry are lead, arsenic, mercury and cadmium. The California Bureau of Cannabis Control (BCC) mandates heavy metals testing for all three categories of cannabis products (inhalable cannabis, inhalable cannabis products and other cannabis and cannabis products) starting December 31, 2018. On an ongoing basis, we recommend cultivators test for the regulated heavy metals in R&D samples any time there are changes in a growing process including changes to growing media, cannabis strains, a water system or source, packaging materials and fertilizers or pesticides. Cultivators should test the soil, nutrient medium, water and any new clones or plants for heavy metals. Pre-qualifying a new packaging material supplier or a water source prior to use is a proactive approach that could bypass issues with finished product. The best approach to heavy metal detection is the use of an instrument called an Inductively Coupled Plasma Mass Spectrometry (ICP-MS). There are many other instruments that can test for heavy metals, but in order to achieve the very low detection limits imposed by most states including California, the detector must be the ICP-MS. Prior to detection using ICP-MS, cannabis and cannabis related products go through a sample preparation stage consisting of some form of digestion to completely break down the complex matrix and extract the heavy metals for analysis. This two-step process is relatively fast and can be done in a single day, however, the instruments used to perform the digestion are usually the limiting step as the digesters run in a batch of 8-16 samples over a 2-hour period. Only trace amounts of heavy metals are allowed by California’s BCC in cannabis and cannabis products. A highly sensitive detection system finds these trace amounts and also allows troubleshooting when a product is found to be out of specification. 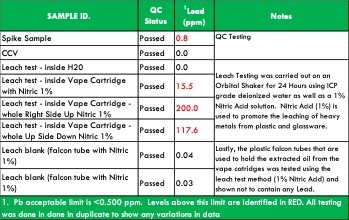 For example, during the course of testing, we have seen lead levels exceed the BCC’s allowable limit of 0.5 ppm in resin from plastic vape cartridges. An investigation determined that the plastic used to make the vape cartridge was the source of the excessive lead levels. Even if a concentrate passes the limits at the time of sampling, the concern is that over time, the lead leached from the plastic into the resin, increasing the concentration of heavy metals to unsafe levels. The ability to detect trace levels of heavy metals is based on the sample size and how well the sample represents the entire batch. The current California recommended amount of sample is 1 gram of product per batch. Batch sizes can vary but cannot be larger than 50 pounds of flower. There is no upper limit to the batch sizes for other inhalable cannabis products (Category II). It is entirely likely that two different 1 gram samples of flower can have two different results for heavy metals because of how small a sample is collected compared to an entire batch. In addition, has the entire plant evenly collected and concentrated the heavy metals into every square inch of it’s leaves? No, probably not. In fact, preliminary research in leafy greens shows that heavy metals are not evenly distributed in a plant. Results from soil testing can also be inconsistent due to clumping or granularity. Heavy metals are not equally distributed within a lot of soil and the one small sample that is taken may not represent the entire batch. That is why it is imperative to take a “random” sample by collecting several smaller samples from different areas of the entire batch, combining them, and taking a 1 g sample from this composite for analysis. California Cannabis CPA. 12/18/2018. “What to Know About California’s Cannabis Testing Requirements”. https://www.californiacannabiscpa.com/blog/what-to-know-about-californias-cannabis-testing-requirements. Accessed January 10, 2019. Citterio, S., A. Santagostino, P. Fumagalli, N. Prato, P. Ranalli and S. Sgorbati. 2003. Heavy metal tolerance and accumulation of Cd, Cr and Ni by Cannabis sativa L.. Plant and Soil 256: 243–252. Linger, P. J. Mussig, H. Fischer, J. Kobert. 2002. Industrial hemp (Cannabis sativa L.) growing on heavy metal contaminated soil: fibre quality and phytoremediation potential. Ind. Crops Prod. 11, 73–84. McPartland, J. and K. J McKernan. 2017. “Contaminants of Concern in Cannabis: Microbes, Heavy Metals and Pesticides”. In: S. Chandra et al. (Eds.) Cannabis sativa L. – Botany and Biotechnology. Springer International Publishing AG. P. 466-467. https://www.researchgate.net/publication/318020615_Contaminants_of_Concern_in_Cannabis_Microbes_Heavy_Metals_and_Pesticides. Accessed January 10, 2019. Sidhu, G.P.S. 2016. Heavy metal toxicity in soils: sources, remediation technologies and challenges. Adv Plants AgricRes. 5(1):445‒446.